Fallkniven’s P series is renowned for its sturdy reliability and originality of design. This is a pocket knife which is really a great cutting tool with the blade made from Fallkniven’s world renowned high quality 3G steel. With its hardness rating of 62HRC, the PsG’s blade will definitely hold an excellent edge even after it is used for several cutting tasks. The blade length of 3 inches enables it to cut through almost anything whilst the folded length of just 4 inches means that it is as slender and as unobtrusive as possible, it will enable you to carry it around strapped to your side and available at a moment’s notice. The liner action locking mechanism is also a revolutionary technology developed by Fallkniven which makes the P3G an attractive proposition indeed. The P3G is quite easy to clean with the back of the handle staying open enabling you to keep this trendy pocket knife in perfect condition. All models come with the classic Black cordura sheath which also attaches itself to the belt making it very handy to carry around and at the same time keeping the knife as protected as possible from the elements. Fallkniven’s P series was inspired by R W loveless, the legendary knife maker who is surely one of the top names in the industry. The P3G is a combination of advanced technology, excellent and genuine handcraft and a design which is surely timeless on all fronts. 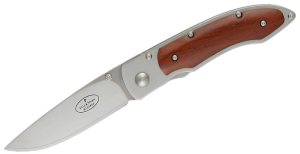 The P3G Cocobolo is a folding pocket knife that has a really sensible size and a very attractive design throughout. It comes after more than twenty years of knife making experience by Fallkniven and can be described as a practical, attractive and hugely reliable knife.